Support For Immigrants’ Citizenship Exists, But How Deep is That Support? A majority of Americans support allowing immigrants who entered the United States illegally to stay in the country if they otherwise have followed the law, a nationwide spring poll by iMediaEthics, a media watchdog group, revealed. 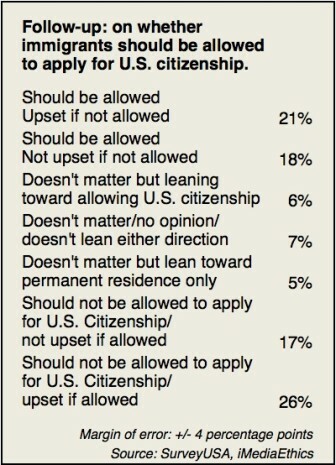 However, opinions on granting citizenship or permanent residency are tightly split, the survey by SurveyUSA, an independent, non-partisan polling firm, showed. The survey was part of the non-profit iMediaEthics’ collaboration and financial support for the polling literacy and public affairs journalism class at the University of Iowa School of Journalism and Mass Communication. Fifty-five percent of those questioned April 13 through 16 said immigrants living in the United States illegally should be allowed to stay, while 39 percent said they should not be allowed to stay. The other 6 percent had no opinion. Among those who held strong opinions, one in three said they would be upset if those living in the country illegally were allowed to stay, matching the one in three who said they would be upset if the immigrants were not allowed to stay. The survey polled 896 people nationwide via landline and cellular phones and had a margin of error of 4 percentage points. 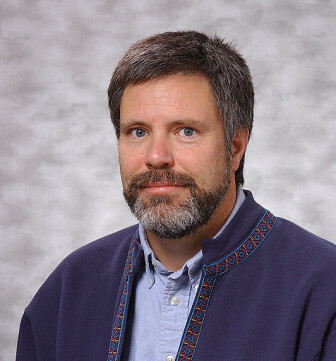 The UI journalism class that helped conduct the poll was taught by Stephen Berry, associate professor of journalism and mass communication and a co-founder of IowaWatch. A bill is under consideration that would provide a path to citizenship for those who have entered the country illegally and otherwise have followed the law. The Senate Judiciary Committee tackled several amendments to the bill this week before sending it to the full Senate on a 13-5 vote. President Obama says he will not sign a bill that does not include a path to citizenship. The SurveyUSA report measured the strength of the opinions expressed by respondents, and cast doubts on the claim of “widespread support” found by an earlier Pew Research poll. The Pew poll found that 71 percent of Americans support allowing those who have entered the country illegally to stay if meeting certain guidelines. That poll, conducted between March 13 and 17, sampled 1,501 Americans over the age of 18 but did not ask follow up questions to measure the intensity of the opinions provided. For example, it asked those who want immigrants living in the country illegally to stay what status the immigrants should be granted. 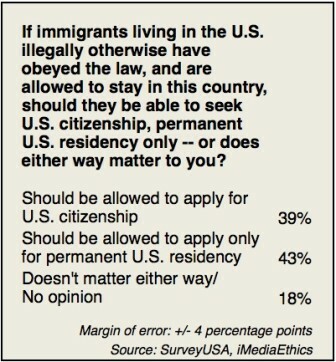 The responses were close to even: 39 percent said they should be able to apply for citizenship, while 43 percent said they only should be allowed to become permanent residents. Lena Avila-Robison, founder of Latinos Unidos of Iowa, said a path to citizenship should be provided to those who entered the country without documentation but otherwise followed the law. “Those individuals, whether brought as infants or if they’ve been here 10, 15, 30 years, they’ve paid taxes, worked hard and spent their money,” she said. Hispanics supported increased border security at the highest rate in the SurveyUSA poll, with 63 percent strongly supporting tighter measures. Fifty-three percent of whites strongly supported tighter border control, along with 48 percent of Asian Americans and 34 percent of blacks. 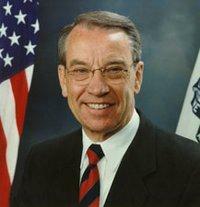 Grassley has introduced amendments to require stronger security along the entire southern U.S. border, give Americans preference over foreigners with work visas in job hiring, and reinstate a one-year filing deadline for refugees seeking asylum. King’s office did not reply to multiple requests for comment on the survey’s findings. Mark Grey, a University of Northern Iowa professor of anthropology who has done extensive work with immigrants in Iowa, said that while he has no problem with strong border security, he does not see it as a high priority. “As a sovereign nation, we have the right to enforce our borders, but illegal immigration at this point is a net zero,” said Grey, who also is director of the Iowa Center for Immigrant Leadership and Integration at UNI. “The fence focuses on Latinos, but it’s much more complicated than that,” he said. About one-third of those living in the United States illegally now initially entered the country legally on a work or student visa but overstayed it, Grey said. Predictably, those in the SurveyUSA poll who self-identified as conservative and Republican were less likely to support allowing those who have entered the country illegally to stay and more likely to support stronger border measures to keep people from entering the country illegally. Forty-nine percent of Republicans said they would be upset if immigrants who entered the country illegally were allowed to stay, and 66 percent of them said border security must be improved. Equally predictable given the political debate on these issues, only 20 percent of Democrats polled said they would be upset if they were allowed to stay, and 44 percent strongly supported increased border security. 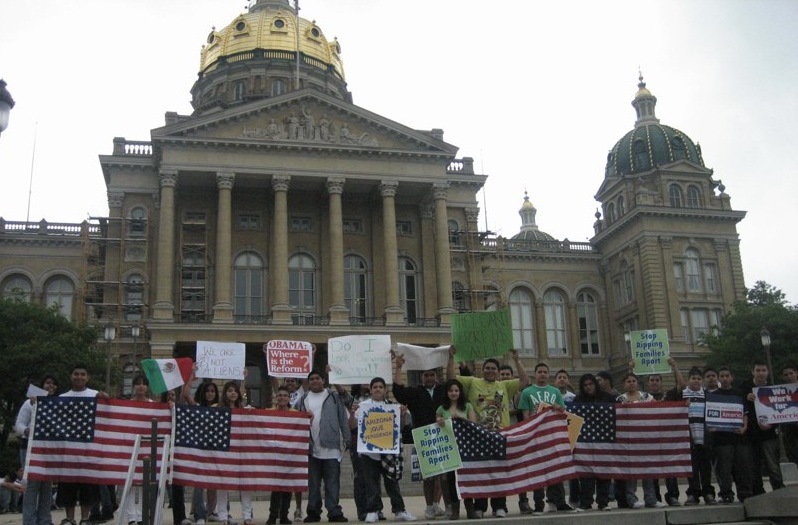 Main page photo from Latinos Unidos of Iowa. 896 adults nationwide were interviewed by SurveyUSA Saturday 04/13/13 through Tuesday 04/16/13. Research, conceptualized and commissioned by iMediaEthics.org, was conducted using blended sample mixed mode, as follows: Adults reachable on a home telephone (68% of respondents) were interviewed on their home telephone in the recorded voice of a professional announcer. The youngest-male method of respondent selection was used on these landline calls. Respondents unreachable on a home telephone (32% of respondents), were shown a questionnaire on their smartphone, tablet or other electronic device. Landline sample provided by SSI of Fairfield CT. Non-landline sample provided by United Sample. Responses were minimally weighted to U.S. Census targets for gender, age, race and region. Each respondent was randomly assigned at the time of the interview to one of two different paths through the survey; depending on the path, respondents heard slightly different question wording. SurveyUSA assigns to each question within the instrument a theoretical margin of sampling error, but such error is useful only in theory, and though commonly cited in the presentation of research results, sampling error is only one of many types of error that may influence the outcome of an opinion research study. More practical concerns include the inability to contact some, the refusal of others to be interviewed and the inability of still others to speak the language. It is difficult to quantify non-sampling errors. The University of Iowa class working on this poll was taught by Stephen Berry, an associate professor of journalism and mass communication, with assistance from David W. Moore, a former vice president of the Gallup Organization and a senior editor with the Gallup Poll for 13 years. Moore is author of The Opinion Makers: An Insider Exposes the Truth Behind the Polls and the pollster and polling critic for iMediaEthics.org. This IowaWatch story appeared in The Gazette (Cedar Rapids, IA), Burlington Hawk Eye and The Courier (Waterloo-Cedar Falls). Winning Latino votes through immigration law promises may be an important election advantage in Iowa.